#WritersWise welcomes all writers, aspiring writers, agents, publishers, readers; basically anyone interested in writing. No problem if you jump in late, just say hello and join in. Please say hello even if you’re just following along. It helps us gauge if the chats are reaching people. Please share the chats with other people and retweet as much as you can to help spread the word. Be sure to include the hashtag in your tweets and responses. 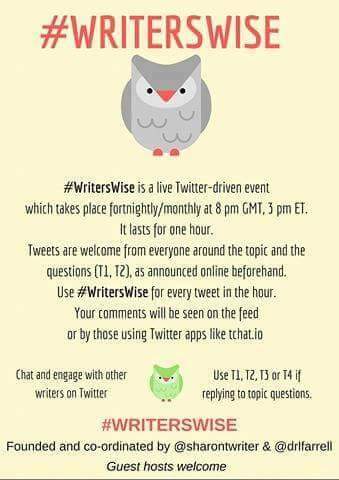 If you use a tool like tchat.io, it will automatically append the #writerswise hashtag to your tweets. Feel free to challenge the status quo with your responses and be creative! However, be mindful and polite at the same time. Be respectful, even if you disagree with someone. Focus on dialogue and solutions. Please don’t discount other people’s stories and experiences. You may disagree & think your way is better. Honor others’ experiences that are different from your own. As our chats have grown in their reach, we regularly become a trending topic on Twitter. When this happens, you may see unrelated posts in the #WritersWise feed. This happens because other people try to abuse trending topics on Twitter and promote unrelated causes and spam. Just ignore or block them. Thank you for joining us on #WritersWise.